I was scheduled to host during this slot and was on line manager duty. However, after the games were all filled both the line manager (me) and the game assigner (Eric) didn’t really have much more of a job to do. Evan “Amazing” Torner said he would stay behind and collect tickets so Kristin, Eric, and me all went off to play in the upgrade, which still had six slots open! Yay…except that we later found out that Evan ended up running a game for some folks that showed up late, making him both the admin person and a GM in a slot he wasn’t even supposed to be on. My first born is already 13 but I think by right she’s yours now Evan. Anyway… onto the game. The Upgrade! is a jeepform scenario by Vi åker jeep (We go by Jeep) that works much like a showcase for jeepform techniques. It uses telegraphing, contextualisation, monologues, insides and outsides, supporting characters, dissolves character ownership, repetition, etc. The Upgrade! was first concieved, in a quite different format, during the Swedish con Halmicon in Halmstad, 2004 by Thorbiörn Fritzon and Tobias Wrigstad. It was then revised completely adding a third author, Olle Jonsson, to the credits roll, for Knutpunkt 2005 in Norway. The game is about our prejudice for participants in reality shows and reality shows. In particular, Temptation Island and the like. Couples sign up to be in the show, are broken up and used to form new couples that date with cameras present and live together in the luxurious Upgrade! resort on some exotic location as far from everyday life as possible. In the end, there is a closed vote by all participants whether they would like to STAY in their old relationships, or UPGRADE to the new one. New relationsships where both partners independently votes UPGRADE get to stay together for another week at the UPGRADE luxury resort. The audience may also vote for the “couple of the week”, or by popular demand force two people into a couple if enough people believe that they would it each other. Couples that Upgrade! are rewarded in the spirit of creating good television. Couples that survive the show end up in the “Hall of Faith”. Sometimes, they will get a reward. We played vain people on a vain game in it for different reasons. Some of us wanted fame, some wanted to show off, some wanted adventure, some wanted a new love, some wanted money, and some just wanted to “CRUSH IT!” (probably my favorite tag line). Not including Scott (who had already signed up to do the lighting) we had 13 players to fill 8 cast member roles, and no specific method of determining who would get those roles. As it turned out 10 folks wanted to be in the cast and two of them self selected out, which wasn’t a good feeling at the time (or as we proceeded). More on this below. After that the eight cast members were given eight characters to pick between. I first selected a character who was casual about their infidelity and though we were playing a game that is essentially all about sensationalizing breaking the norms of relationships, I just didn’t feel like starting off with that in my background. I traded characters and settled on Alessio, who I played as far more exuberant (spotlight hog, super upbeat) than the background depicted, but otherwise felt good about. Either just before or just after character selection we had a talk about safety techniques including the equivalent of cut/break (changed somewhat since “cut” is a term we would use as part of the directing style. Then we talked about touch boundaries, which I think is an entire other topic of conversation (and has been on G+). Once we had selected characters, one of the Hosts met with the audience to prepare them for the show, and we were sent out of the room with questionnaires to fill out. One that we would do individually, and one that we would fill out as a couple. For me this was actually the funnest part of the game. Kira, John, and I sat around a table filling our forms out. About halfway through Kira (playing Patti) and I realized that we were partners and the form filling (which I know, we were supposed to do by ourselves) became much more fun. Some of the questions were really hard to imagine answers for, so bouncing ideas off each other was great. When we got to the couple questions though, oh, it just shined so much! I felt like Kira and I were this amazing creative team making this super fallible couple were just a delight to talk about and by the end I really wanted both of them to be happy. They were self centered and vain but also cared about each other, and Patti’s young son John. I think some of my favorite antecdoes were Alessio’s pet name for Patti was was Patty-Cakes, which he would say when she got out of bed in the morning and he patted her bottom, and that “their” son was “Everything I Do” by Brian Adams. So corny! Though the longest section, this part is the most like you’d expect. We were cast into scenes to create drama and tension, as well as audience members being cast to play other versions of ourselves (past versions, re-cut versions, future versions, etc.). It was predictably ridiculous and horrible in that that delicious way that reality television always is. I embraced the premise pretty fully and played a character who wanted to showboat and “win” in terms of being popular on the show, but really wasn’t sure about actually “upgrading” (thought both Patti and Allessio did in the end, Hah!). The end of the game tries to reproduce the prisoner’s dilemma but it puts the reward on the wrong side of it, so there’s no actual tension. 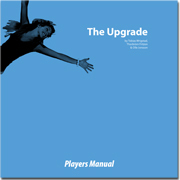 There’s no penalty for “upgrading” so instead of the “best” result being the one that is hardest to achieve (neither member of the couple upgrades), the best result is the easiest to achieve (both upgrade) and the middling result (one upgrades, one does not) is still just as good for the one that upgrades. So it’s built up like a dilemma, but it really isn’t. After the game we had a discussion of about how we felt, and were asked if there was anyone we want to apologize to. Debriefs, like touch boundaries are also a discussion of their own. Some of my thoughts on those below. After having just got out of Bluebeard’s Bride, it was great to play something light and silly (even if the premise is kind of the worst thing ever). There were these moments, usually the ones “off camera” when I was just sitting next to Dana or John or Kira or Brodie and we had these in-character but not in-persona (i.e. we weren’t trying to showboat for the camera) moments that were just great. I really wanted to connect with Helen (played by John) but there was never quite the time to do it. Some of the scenes were just amazing. Unpredictable, over the top, silly, and sometimes racy! The hosts put a lot of energy into keeping our energy up, and a lot of that was done by calling on familiar tropes. Having every scene sponsored by some company, having them all shot “on location” and having the directors constantly tell us to spice it up or to make it more catty, was all great to invoke the pseudo-drama of reality TV. Suggestion for selection of roles: During sign ups have two sign up options: Cast and Audience. When you go to sign up you can pick which role you want to take until all of the cast (8 people) is filled and then you can only choose to be an audience member. That way, in being in the audience isn’t something you’d enjoy, you can just select another game. Suggestion for safety rules: Make sure you have the rules in context. For example we had a primer on telegraphing when you’re going to touch someone, only then to determine there would be not touching. Also, if there is a no touching rule, the hosts have to be vigilant to maintain it. Advertise the expected touch boundaries in advance. If you know your game requires touching or not-touching, add that to the description. Keep them positive if possible. We were asked if there was anyone we wanted to apologize to and then went around the room taking this really fun game and suddenly finding reasons to feel bad about it. Apologies should certainly be given if there is a reason but asking everyone if they have something to apologize brought the mood way down. 5. Emotionally bond / de-bond? 7. Reinforce meaning or challenge meaning? 8. Avoid the outside world by lounging in the magic circle a little longer? 9. Figure out how you feel about the other players, outside of the game? 10. Figure out how you feel about the other players, inside of the game? 11. Figure out how you feel about your own character? 12. Figure out how you feel about yourself? 13. Figure out one of the many possible combinations of the last 4 things? Because we tend to assume some combination of those things, but often without actually articulating, examining, or dealing with what that means, how we get that, or why. Make it very clear when the debrief is over by enacting a physical ritual, such as everyone getting up and putting away their chairs, leaving the room, or otherwise changing their environment. Discussion can continue if there are those who want to, but nobody is obligated to continue the discussion and the discussion doesn’t just continue unconsciously or because there is social pressure to stick around.